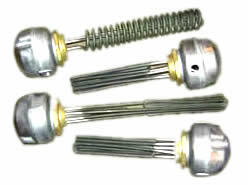 24kW Industrial Immersion Heater - PII24 - Process Heating Services Ltd.
Immersed length of 1100mm or 43″. 200mm or 8″ inactive or cold end. 3 x Incoloy 800 (“a superior stainless steel”) 8mm diameter 156” elements. On our stock 24kW industrial immersion heater we use 6″ cold or inactive ends by default in case our customers need to fit the heater vertically, allowing a little leeway for level drop within the tank. This extended cold end also prevents any issues of tunnel heating, which can be problematic if deep weld bosses are used. With a 2″ cold, an inch is lost into the screwplug, so only the first inch is really unheated. …or call Jamie on 01827 703228 to discuss your 24kW industrial immersion heater needs. Whilst the “Contacts” forms serve a purpose, there is no substitiute for a telephone conversation, perhaps supplemented with a photograph or two to jamie@nullprocessheatingservices.com. Everybody’s applications is different, and we take a pride in getting everything right first time. The best way to achieve this is through a two way discussion. We look forward to helping you address your requirements.